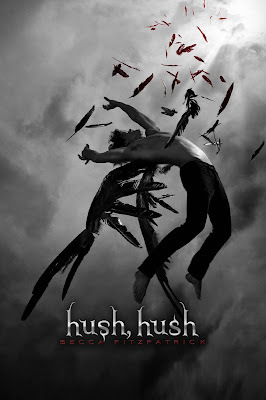 Hush, Hush (Hush, Hush book 1) by Becca Fitzpatrick. Romance was not part of Nora Grey's plan. She's never been particularly attracted to the boys at her school, no matter how much her best friend, Vee, pushes them at her...until Patch comes along. With his easy smile and eyes that seem to see inside her, Nora is drawn to him against her better judgment, but after a series of terrifying encounters, Nora's not sure whom to trust. Patch seems to be everywhere she is, and to know more about her than her closest friends. She can't decide whether she should fall into his arms or run and hide. And when she tries to seek some answers, she finds herself near a truth that is far more unsettling than anything Patch makes her feel. For she is right in the middle of an ancient battle between the immortal and those that have fallen - and when it comes to choosing sides, the wrong choice will cost Nora her life. Something, or someone, dark and sinister is lurking in the shadows. Watching Nora and waiting. But waiting for what? Nora Grey, a responsible high school student who recently lost her father in a brutal murder, has her hands full with fallen angels, a haunting presence, a threatening man in a ski mask, and more than one boy interested in her romantically. Hush, Hush was a wonderfully exciting paranormal read full of suspense, danger, and romance. I would recommend to Hush, Hush to readers of paranormal romance, young adult, suspense thrillers, and urban fantasy. Hush, Hush on Amazon . I've been wanting to read this book forever, but I've seen mixed reviews on it. Sounds good to me, though! Thanks for hopping by a couple of weeks ago, I'm sorry it's taken me so long to hop over! I too have read mixed reviews, but oh my goodness the cover alone has me wanting to read it! I loved this one, I plan to read it again! Thanks for the great review!